Hunter Philip Culpepper, Male, born __ 1991 in Harris Co., Texas, child of Kimberly Joan Culpepper. Hunter Philip Culpepper, died 19 May 1999 in Galveston Co., TX. Kelly Suzanne Culpepper, Female, born __ 1970 in Harris Co., Texas, child of William Xermo Culpepper and Joan Pamela Meier. Biography � I am now able out flesh out the Rawlings tree a bit more. God bless a man by the name of Robert Miller who contributed from Find a Grave! The links even have photos of the headstones. So we now know that George Washington Rawlings was born on Nov. 13, 1839 and died Jul. 30, 1912. HIs wife Malissa was born Jan. 15, 1844 and died on Dec. 18, 1926. There are also links to the graves of several of their children. I also saw that both my paternal and maternal side have something in common, they were Masons. I was surprised to see the Compass and the Square on George W Rawlings head stone. The notes are correct about George's father Henry. He was born sometimes in 1781 In Brunswick Co, VA. His wife was Priscilla Moody. They were married on February 18, 1817 in Brunswick. Not sure either about the exact dod. Halifax Co., NC Wills, Feb Term 1857, Will of Henry Rollins. To daughter Mary Jolly, wife of Asa Jolly, bed etc. To son Jess Rollins one dollar and forgiveness of debts. To wife Priscilla, remainder of estate and to support "my two youngest children, Rebecca and George W. Rollins, and my daughter Margaret and at her death to be equally divided between my living children or their lawful issue if any, except" part to heirs of dau Jane, wife of Richard Pierce to be paid separately to a guardian to be appointed. Wife is Exec. Wit: W.W. Dancil Jr., A.A.B. Southall. Signed, Henry Rollins. Correspondence from Laurie Rutledge Plapp, 622 Meadowglen, Duncanville, TX 75137, e-mail address to Culpepper Connections, 2004-2008. GC-Lauderdale Co. MS Queries Forum, http://cgi.rootsweb.com/~genbbs/genbbs.cgi/USA/Ms/Lauderdale/858. E-mail written Aug 2000 to Lew Griffin from Judy Gilmer, e-mail address. Researcher* 8 Jan 2013� Ellen Martin wrote: "My husband's grandfather (John Parson William 'JP' Vickery) was one of Elizabeth Susannah 'Anna' Vickery Culpepper's brothers. Saw your info online. 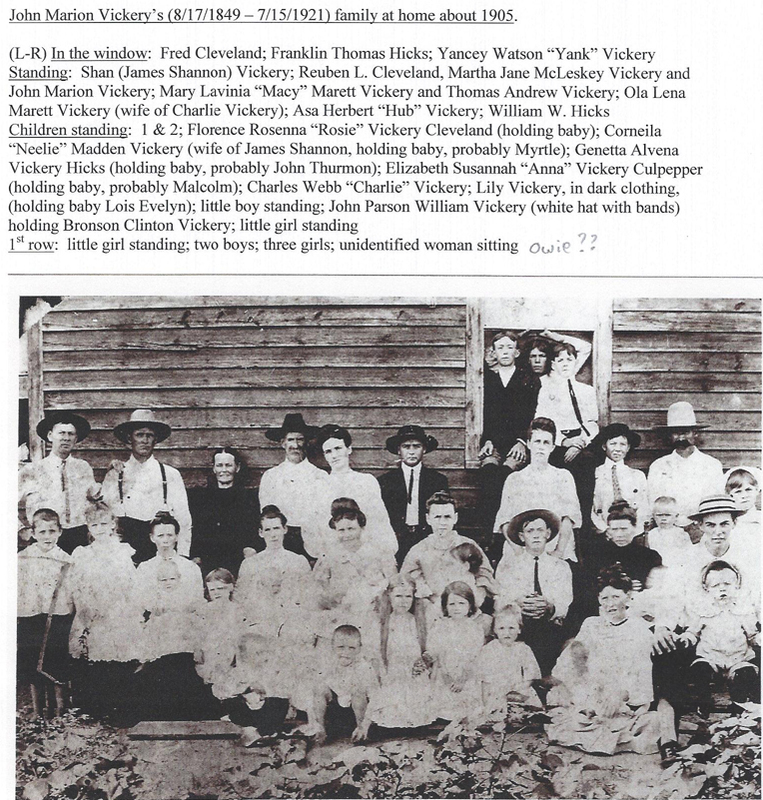 I have been working on a Vickery family genealogy project for several years. Now have over 450 pages of information and pictures. JP and his oldest daughter, Lois, lived in a house in Hartwell, GA that had been Anna's house. I have photos of the house. Unfortunately, after Lois died in 2006, the house was bought by a church and torn down. "Do you have any old photos of Anna and family, or know anyone who might? I have not been able to find too much info on Malcolm's and Anna's family. Anna died 10/4/1953. Have not found much info on Anna's sister, Emma Iowa 'Owie' Vickery Vernon (2/29/1876-2/13/1942). She died in Alabama. I have all of the other siblings info and pictures up to the present time. Have talked to many Vickery family members. Most have been very helpful with my project. 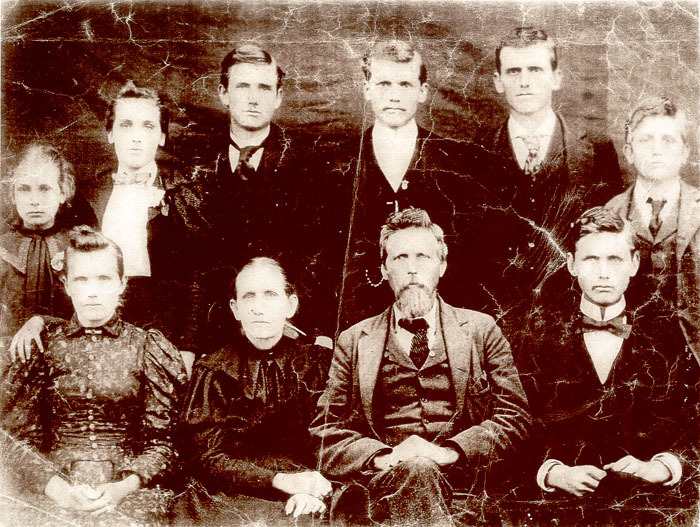 Anna's parents (John Marion Vickery, 8/17/1849-7/15/1921, and Martha Jane McLeskey, 3/22/1852-7/11/1934) had 11 children. E-mail written 8 Jan 2013 to Warren L. Culpepper from Ellen Martin, e-mail address. Loyd B. Culpepper, Son, M, Apr 1899 (1), S, GA/GA/GA. Northview City Cemetery. Carolina Street, Hartwell, GA. Two blocks behind Hartwell Post Office. - Malcolm Cade Culpepper, 1903 - 1948 (s/o Malcolm and Anna). Margaret Culpepper, Dau, F, 4, S, GA/GA/GA. Margaret Culpepper, Dau, F, 13, S, GA/GA/GA. Malcom M. Culpepper, d. 21 May 1923 in Hart Co., GA.
Anna B. Culpepper, Head, F, 55, Wid, md @ 15, GA/GA/GA, Unemployed. Pinic L. Culpeper, d. 1 Jul 1936 in Hart Co., GA.
Mccade Culpepper, d. 30 Jul 1948 at 45 years in Hart Co., GA; Res. in Hart Co., GA.
South Carolina Death Records, 1821-1960, lists, name, Anna V Culpepper, b. 16 May 1874, d. 4 Oct 1953, age at death 79, death place, Anderson, South Carolina, Certificate Number, 014034. Tom Eakew, Helper, M, 16, S, GA/GA/GA, Md(? ), GA/GA/GA. Derrius Patterson, Boarder, M, 17, S, GA/SC/GA, Farming. Mack C. Culpepper, Brother-in-law, M, 27, M, md @ 26, GA/GA/GA, Svc Station Mgr. E-mail written 2004-2008 to Warren Culpepper from Jeffrey Edgar Culpepper (#49717), 752 Orchard Ave., Ormond Beach, FL 32174, e-mail address (Mar 2012). Loyd Culpepper, Lodger, M, 22, Sng, AL/AL/AL, Electric RR Conductor. Mae B. Culpepper, d. 11 Nov 1977 at 88 years in Hart Co., GA; Res. in Hart Co., GA, 043271. Obituary* 16 Feb 2016� Marilyn Mayer Culpepper passed away very peacefully on Valentine's Day 2016, which happened to be her favorite holiday. She was born in Flint, MI, to Florence and Glenn Mayer. She moved with her parents to Lansing, where she spent the rest of her life. Marilyn was predeceased by her beloved husband, Tom. Marilyn graduated from the University of Michigan with a BA, from Columbia University (New York) with an MA, and from the University of Michigan with a Ph.D. She was a guest editor for Mademoiselle Magazine in 1944. She was a professor at Michigan State University for over 50 years. She authored and co-authored several books, primarily on American History. She was a member of the First Presbyterian Church of Lansing, Kappa Kappa Gamma, Junior League of Lansing, Woman's Club of Lansing, University Club of MSU, and the Michigan Women's Historical Society. - Writing for Life: A Writer's Reader (Paperback, 1988). Obituary of Marilyn Culpepper, published in Lansing State Journal on Feb. 16, 2016. Correspondence from Jack Thomas Culpepper (#3117), 12355 South Lakeview Court, Gulfport, MS 39503, to Warren Culpepper, 2007-2008. Obituary of Bobbie Nell Culpepper Burks, published 2 Feb 2007. Sarah F. Dandridge, Mother-in-law, F, Wh, 74, wd, VA/VA/VA.